Let's Talk Essential Oils for Thyroid Support shall we? It seems every second woman that I talk to these days is dealing with some kind of thyroid imbalance which I find fascinating but also disconcerting. Officially it's 1 in every 8 women. That's what the stat's show. I am dead certain that my own experience with Graves Disease was triggered by a super crappy lifestyle back in my late teens/ early twenties. I was incredibly unhappy, eating all the wrong things, hanging out with the wrong crowd, doing way too many drugs and in short...just not doing a very good job of looking after myself. That all came to a head when my weight plummeted to 45kg despite ravenous hunger, my arms and legs became so incredibly weak that I had trouble making it through routines at dance classes, I couldn't sleep and my heart rate was out of control. All indicators of an over active thyroid. I ended up in ER one day during end of year rehearsals for my ballet concert as my heart just wouldn't stop pounding to the point I felt so so sick. A thyroid dysfunction will either display as either over or under active. Under active symptoms are pretty much the exact opposite of what I described above- you feel sluggish and lethargic, intense brain fog, unexplained weight gain, wanting to sleep all the time, cold extremities, depression, thinning hair and a really slow heart rate. I don't want to turn this post into an essay so I'll leave the reasons why this occurs etc out and get straight into which essential oils can support you with restoring and maintaining the health of your thyroid. I think it's important to remind everyone here that if you don't address your diet, gut health and lifestyle, essential oils will only get you so far. They aren't a magic bullet and work best in conjunction with going grain/gluten free and sugar free. Essential oils will absolutely get to work reducing inflammation and supporting your immune system BUT, if you continue to feed your body from the $2 menu and put your body under stress......they have an uphill battle. Give your body the right tools it needs to thrive and heal. I am 100% for an Anti Inflammatory diet aka one that is packed with veggies from every colour, high quality meats and plenty of high quality fats. I don't consume grain or gluten because these contribute to inflammation in the body. I think of this as a Fat Adapted Paleo Diet. For an under active thyroid, use oils with stimulating and balancing properties. For an overactive thyroid, use oils with calming and balancing properties. Clove Oil – This oil has an antioxidant (ORAC) score of over 1,000,000 making it an all round body tonic for general health. Clove is also high in phenols (about 80%). “Phenols clean the receptor sites of the cells. Without clean receptor sites, cells cannot communicate and the body malfunctions, resulting in sickness.” – Dr. David Stewart. Clove has demonstrated abilities to regulate and stimulate the immune system by increasing white blood cell count and reducing inflammation. Clove is great for over active thyroids. Frankincense Oil – Frankincense is the mother of all oils and it’s fantastic for healthy cell support. Frankincense is high in Monoterpenes which help reprogram miswritten information in cellular memory. It's been shown to regulate and support balanced thyroid function and is excellent with supporting inflammation whilst calming the flightiness and restlessness that can be associated with Graves. Terrific for both over and under active thyroids. Myrrh Oil – The key oil for nourishing the Thyroid. This oil has been used for thousands of years and can help reduce stress and support the thyroid. Terpenoids are strong antioxidants that have anti-inflammatory properties. Myrrh has immuno-protective properties with one study showed that it can modulate both Th1 and Th2 cytokines. An excellent thyroid balancing oil to use no matter which way yours is swinging. Lemongrass Oil – This is a great oil to use to support the thyroid – again, this is a balancing and tonifying essential oil for the thyroid. It's wonderful to support the nervous system which can begin to feel rather fragile with thyroid dysfunction. Lemongrass is also highly anti inflammatory which is terrific because inflammation is both a cause and a byproduct of thyroid malfunction. Basil – Basil helps support the adrenal glands. When the body needs thyroid support, it usually also needs adrenal support, so it’s a good idea to use this oil on a regular basis to support the adrenal glands. Best for slow thyroids. Geranium is another essential oil that is wonderfully supportive for the adrenals. Peppermint – Peppermint can help you feel more alert, and support the body when it feels fatigued. It's a stimulating oil making it perfect for sluggish thyroids and helping you get on with the day when all you want to do is sleep. Marjoram – Marjoram supports the spleen. The spleen is an important organ in the immune system producing the white blood cells that fight synthesised antibodies. This oil can be a good oil to help support healthy antibody levels. A good choice to include in your overactive thyroid blends as it helps us move into the Parasympathetic Nervous System. Balance - To bring us back into that Parasympathetic state where our nervous system is in rest and repair state. This is where the beauty happens for us. Quite literally being in the 'Green Zone' of the PNS helps us look and feel amazing, digest our food better, regulate the immune system's response, balance hormones gosh... basically everything happens in the Green Zone rather than the Red Zone of high alert in the fight or flight Sympathetic Nervous System. Balance is an incredible blend to help us sink into the Green Zone and let our immune system settle down. Myrrh, Lemongrass, Basil, Peppermint and Clove are good to use when the thyroid is on the slow side. Together these oils are all about stimulating, balancing and energising. For an overactive thyroid, it's very important to focus on the health of the adrenals, and being in a "para-sympathetic" state. 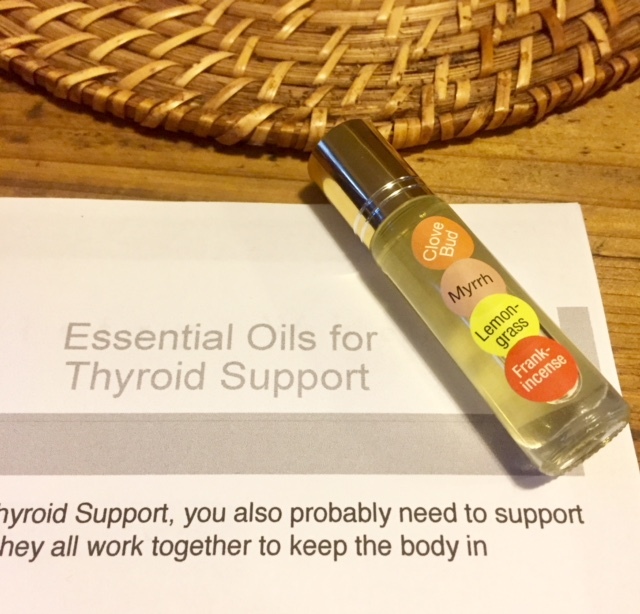 Myrrh, Lemongrass, Frankincense, Geranium and Marjoram are all great for overall thyroid support, adrenal support, calming the nervous system and normalising the function of an overactive thyroid. The blend in the image is best suited for balancing and stimulating an under active thyroid but remember you can choose any combination of the oils I have mentioned. I rub a drop of Myrrh over my thyroid area each and every day for general balance and as a preventative measure given I presently have no thyroid issues. If you’re not comfortable using stronger concentrations, feel free to lower the amount to 5 -10 drops of each. 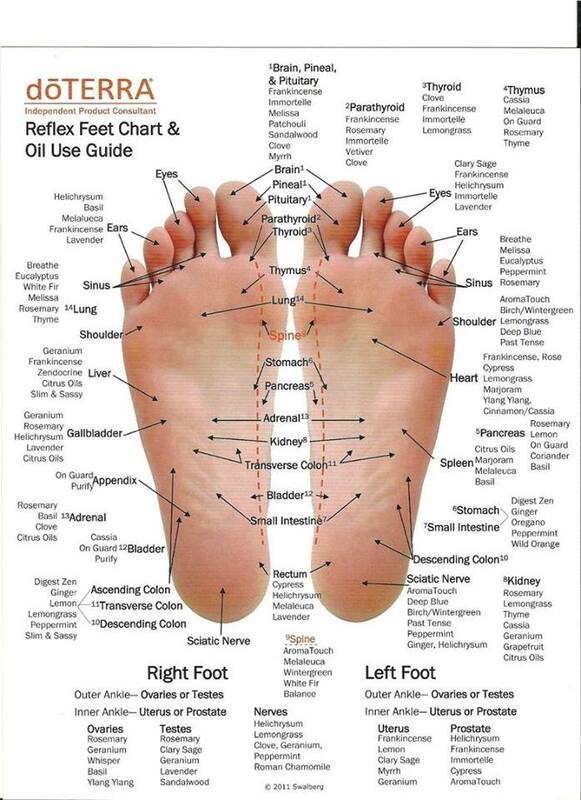 You might like to experiment with applying your essential oils to the reflexology points for the Thyroid on your feet which lie just at the beginning of the big toe around the main crease area. Apply your oils to this area on both feet and massage to stimulate those energy points. Have you got questions for me?I'd love to talk to you about my experiences with Graves Disease and how I personally approached my recovery. If you don't have a membership with doTerra, I can help you with that in a matter of minutes and guide you towards choosing the right essential oils for you.